D3, it is probably the best thing you can do for your body and your health; especially in the cold winter months. How do you dose your family? How much D3 should a person take? Can you overdose on D3? Remember, I am NOT a doctor, I am not a medical professional. I am relaying to you what I do for my family. What you do for your family is up to you and at your own discretion. Please talk to YOUR doctor before starting any vitamins and evaluate all risks. Kiser Ridge Farm and all persons associated with Kiser Ridge Farm take NO responsibility for any actions you take after reading our informative blog. Recommended daily dose of vitamin D3 is 35ius/ per pound of body weight/ per day. First things first? How much is too much? The link below has some great information and a helpful chart that shows just how much it takes to overdose on Vitamin D.
Am I Getting Too Much D3? This is the product we use: There is also a link to the elderberry we use during flu season. Below this is the dosage we use for D3. Elderberry follow the package instructions. (700ius per day x 7 days in a week= 4,900ius per week). I give him one of our 5,000iu capsules every Sunday. That is 5,000ius every 2.3 days. So to keep things simple, I give him one 5,000iu capsule every Mon, Wed, Friday. My 118lb, 13 year old should get 4,130 ius per day. so if I give her 5,000ius 6 days per week then she is getting 30,000 per week but skipping Sunday is taking up the space of the extra 2,000 per week. So I give her 5,000ius/ 6 days per week. Skipping Sunday. My 200lb husband and big boys get 5,000 daily, some days they take 10,000ius to fill in for the extra. I am 146lbs I take 5,000ius to 10,000ius per day depending on situation. Women over 25 tend to run low. By dosing our vitamin D3 this way I only have to buy one bottle of 5,000iu D3 for the entire family. Which means I can buy in bulk and save. 🙂 More bang for my buck. You can buy different strengths and dose daily if you prefer. 2 Stories of when it worked for us. This past June 2014, Dad came home sick, very sick on a Wednesday night, he had been kind of cruddy all week with what we thought was allergy type stuff, but this night he had a HIGH temp and body aches . He stayed home from work on Thrusday, took some D3, elderberry and vitamin C and returned to work on Friday feeling some better. Friday he took D3 again. Saturday he felt pretty good. Sunday he became EXTREMELY ill, and we ended up in the ER for what we thought was pneumonia ( I should add here that he had been pressure washing our hog lot on the Saturday before symptoms started so we were thinking he had inhaled some poop mist.) He has never been to the doc except 3 times and NEVER to the ER, so I was certain he was dying when he agreed to go. At the ER he presented with a temp of 104.9 they checked for and treated for pneumonia. When the chest xray was clear and several other tests came back negative they finally did a flu test. GREAT I have a 5 week old in my arms, 4 other kids at home, and two elderly people. Monday morning the 5 week old wakes me up at 3 am with a high temp. Off to the doc, POSITIVE flu test. Home to give 5,000ius to the 5 week old, and everyone else. HONESTLY, the 5 week old baby had a fever for less than 24 hours and NO OTHER symptoms. NOTHING!! The only treatment was TONS of prayer, lots of Mommy milk and D3, 5,000ius for 3 days in a row. NOW FOR THE GOOD STUFF!! PROOF!! Links about the importance of D3. Read all the way to the end. Great Research. Vitamin D Council. TONS of useful D links. This article relates information just being released about low vitamin D levels and increased pulmonary diseases. The association between vitamin D and tuberculosis (TB) has long been known. Specifically, in TB patients, low levels of vitamin D are associated with the activation of the disease. But what about in those who are healthy? A study of people in Pakistan who were healthy but in close contact with TB patients found a similar association. Those with low levels of vitamin D, especially women, were five times more likely to get tuberculosis. Thus, low levels of vitamin D may be a risk factor for tuberculosis. However, the value of vitamin D supplements for preventing TB infection is still unknown. The next three sites are personal opinions of the authors, but they do contain some great points about the use of vitamin D. I am not sure of the validity of some of the studies they cite, as I have not read those studies myself and they give no link to the source. I did read the Japanese study somewhere else, but it has been a couple of years ago and I am not sure that is the same study the author of the first site is quoting. 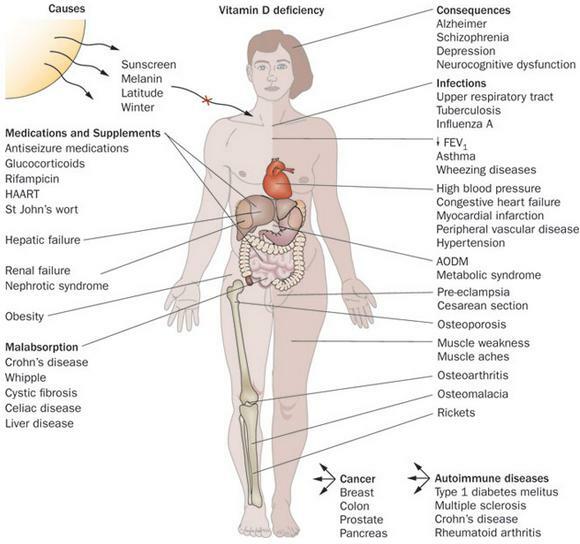 The chart below shows common causes of Vitamin D Deficiency on the left and Consequences on the right. alternative, attachment parenting, crunchy, herbal meds, herbal tea, herbs, immune boosting, immune system, medicine, real food, supplements, treatment. Bookmark.